Minnesota's top ventilation expert & contractor, offering a wide range of services centered on residential and commercial ventilation systems. With over 30 years experience, Ryan's has a wide range of ventilation services and products. Ventilation is a must for any structure. Ventilating your attic is a must if you have asphalt shingles, which require proper ventilation to comply with the shingle manufacturer's warranty. In our Minnesota climate, ventilation provides protection from ice dams and snow build-up on roofs. The vents on your roof let warm air from your attic out, which if left alone will melt the first layer of snow and ice creating a ice dam around your gutters and eaves. 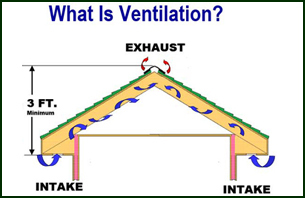 Ventilation can come in a variety of forms, from simple roof vents, vented soffit too high power roof vents. Only a roofing / insulation contractor will know which product is best for your home. Call us today for a free estimate.